Welcome Back to W&W! I hope you’re enjoying the new setup and look of the blog! I spent hours working to make it perfect for everyone. So here’s to a new beginning here and even more growth. Today is all about my September favorites; ya’ll know the drill…I love to share all about the things I’m loving each month and cannot get enough of. This month I was able to try a few new things along with some old favorites. Every month, this never fails to be my favorite posts and I hope you love them too. 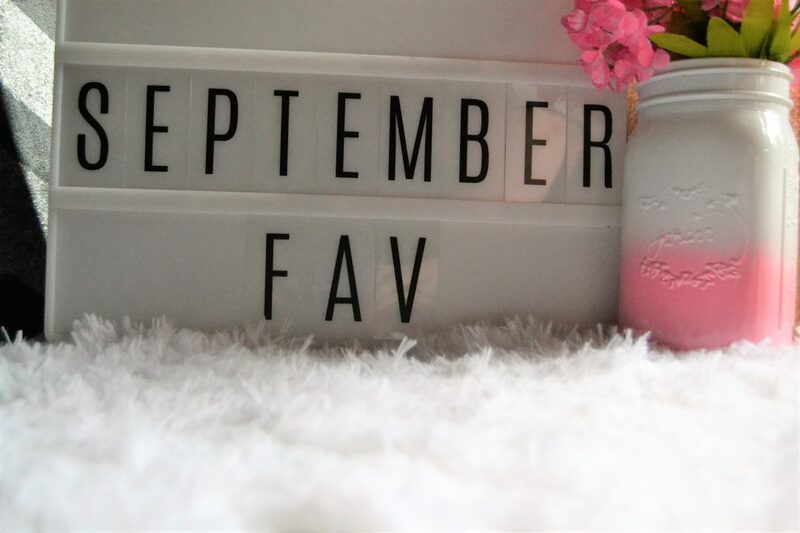 Let’s get started on these September favorites! That darn mini area at Ulta that you look through while you wait to pay got me again! I had been eyeing this spray for a while and finally just picked it up; purchasing two small bottles for $15. The price was frustrating but after using it, I can tell it was worth every penny. Especially here in OK, it is still pretty hot and humid even though it is October. I use this spray all the time! If I start to get hot, I spray. If it is humid, I spray it. Well, you get the picture. I keep one bottle in my purse and one bottle in my room. This is refreshing, hydrating, and feels so lovely on the skin. I finally took the plunge and purchased a Morphe palette; am I an official beauty blogger now? 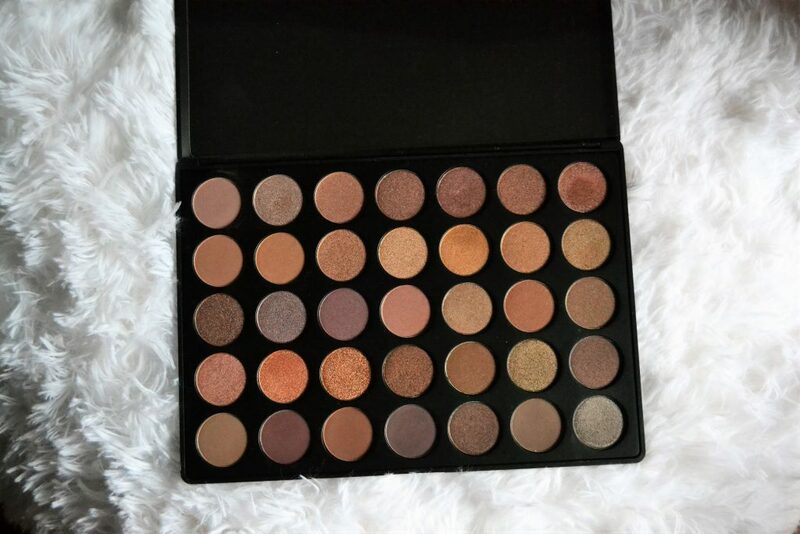 I purchased the 35T palette which is 35 taupe shadows. The taupe palette was a great start for me! It has a good amount of mauve, tan, and well taupe shades. The thing has a great mix of shimmer and matte as well. I do think the palette is a little more brown than I wanted, but it is making me get out of my comfort zone and try new things! So far these are great, buttery shadows that blend well. I can’t wait to keep using them! There are so many looks that you can do with this size of a palette. 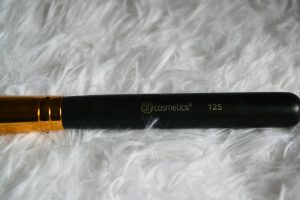 A while back I purchased a BH Cosmetics brush set and this 125 brush was one of them. It says it is meant for contour but I use it for under my eyes. I needed a small brush to set my under eye concealer with powder and this is the perfect one! It is tapered so it is really great for getting right up into the corners of the eye and setting it. These brushes are extremely soft and great quality. I have been loving all these this month but especially this one. 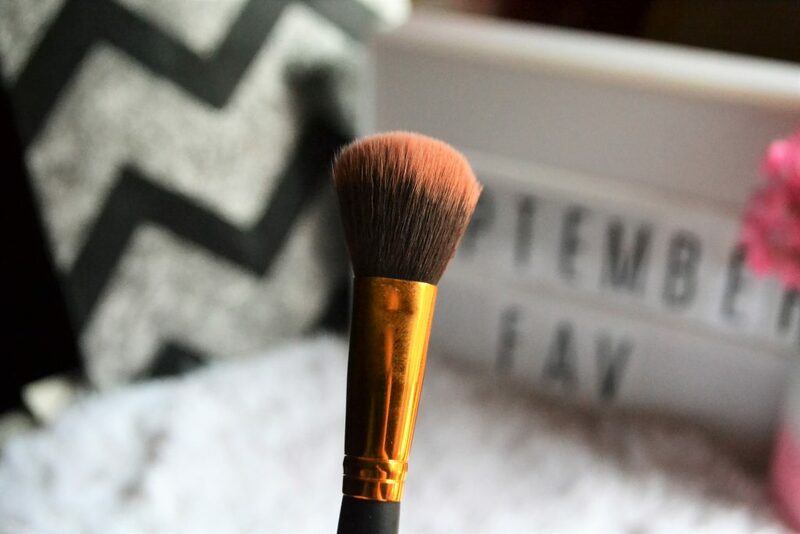 These brushes could all be on my September favorites for sure. I’m hoping to do a whole review on the set soon. I have really been wanting to purchase the Stila waterproof liner that is so completely hyped and called the best liquid pen liner. 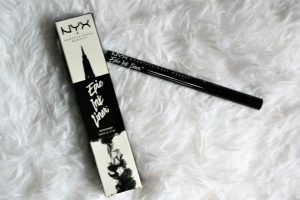 BUT, I’m also cheap…so instead of automatically starting with the $22 liner, I thought I would try the cheaper NYX version. It’s supposed to be waterproof and I will say, it is definitely not completely waterproof. Withing a few hours my wing was completely gone and had some signs of smudge. For the price, it is a pretty good alternative…but I have a feeling I will eventually get the Stila one. However I really like this ones tip and it has great pigmentation. I’ve really been loving it and knew it had to be part of my September Favorites. 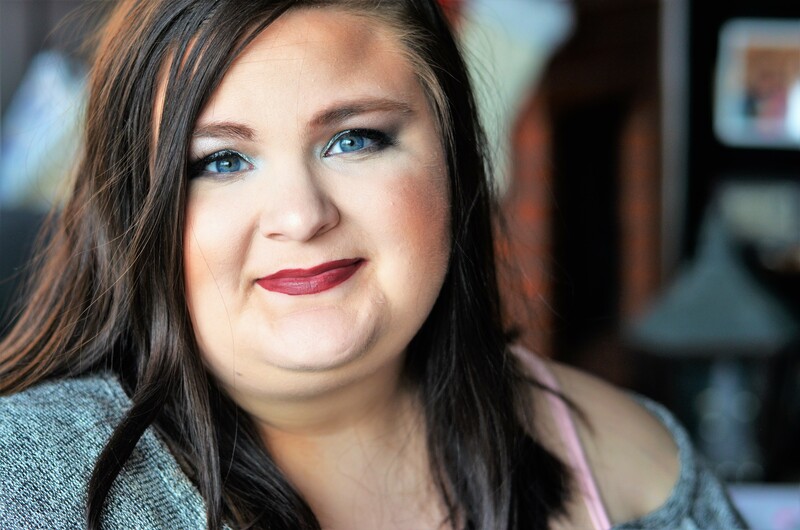 Influenster sent me this complimentary a few weeks ago and I am still love this foundation. I am so impressed with the wear, packaging, and feel on the skin. It has great, build-able coverage and I have been using this all month long! It is still the wrong shade, so I have to add a mix-in but it doesn’t make a difference. I love the fact that it has a pump too, you have so much control of how much product you use. 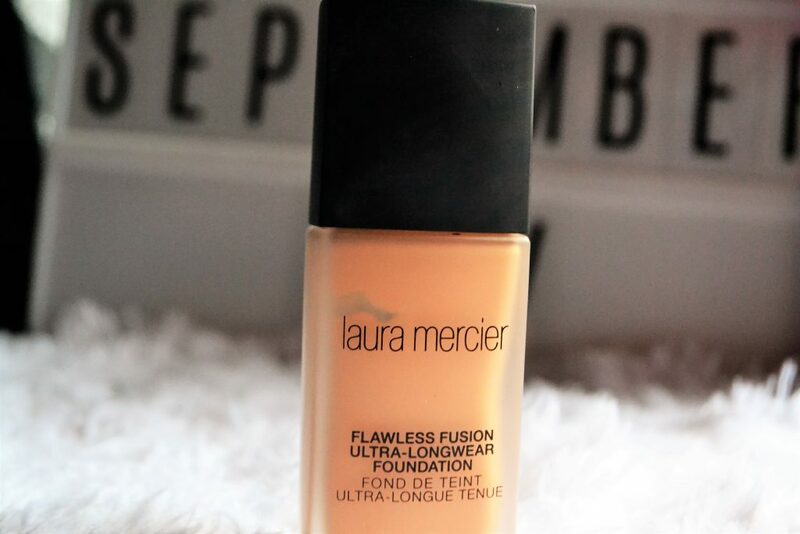 I highly recommend this foundation and I knew it had to be on my September Favorites. 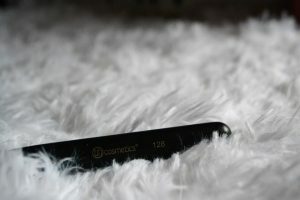 If you’re looking for a great multi-use brush…I would highly suggest this one. It is titled as a “blush” brush but I love using it for blush, bronzer, contour, and even highlighter. It has a great shape and good density. 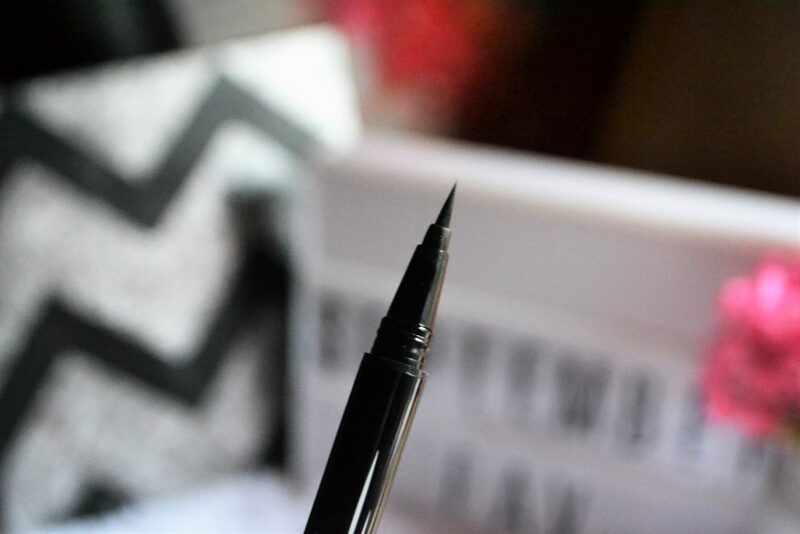 I love the feel of it on my skin; I’m picky about the kind of bristles I use but this one passed the test-making it to my September Favorites! Once again, this was part of a kit but the whole kit is worth it! I just loved this one and 125 the most this month. It is one I hope they sell separately because I would buy many! A while back I purchased this Bible for myself. 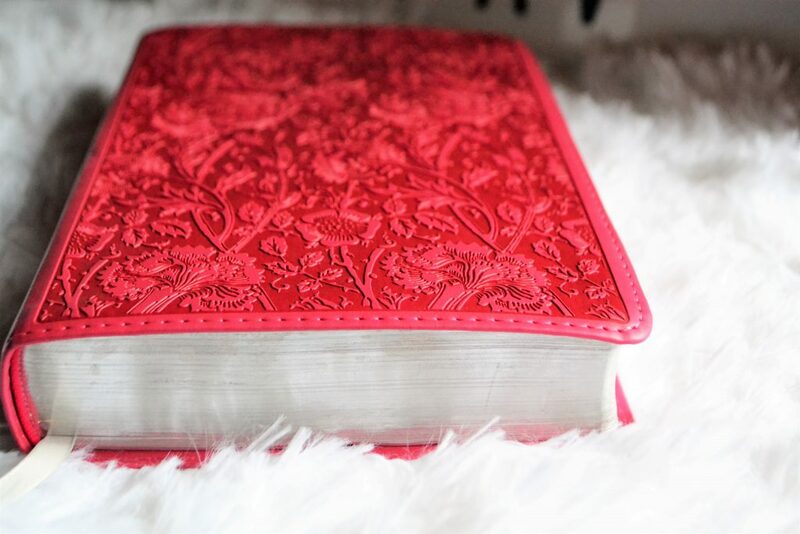 Most of my old Bibles were specific for teens, students, or Bible journaling and I really wanted a lightweight one I could take to church, studies, and anywhere I wanted to take it! I love the outside, so smooth and bright! I also love that it has a single column in the inside so it is really easy to read and understand. It is the English Standard Version, the version in which my pastor preaches from, and was really affordable at Mardel. 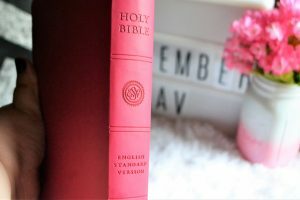 If you are new to reading the Bible I highly recommend this one; and it comes in other colors. It has a reference table in the back where you can search for “trust” or “salvation” and get the coordinates for verses about that topic. I hope you enjoyed these September Favorites! 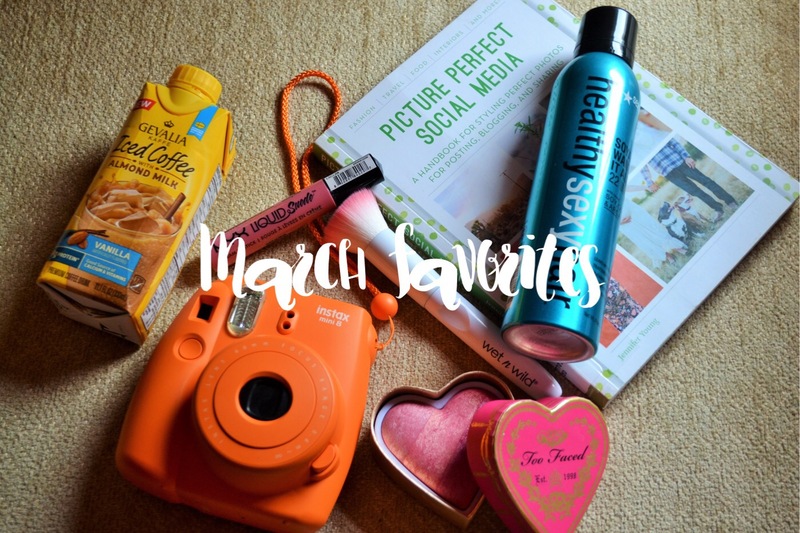 I always love these posts and love hearing what you are loving each month too! Tell me in the comments what you loved this past September! Congratulations on your new setup for the blog! I love the evian spray as well! Thank you for your updates, this was a fun read! Ohhh I love the new blog! So many fun finds!! Thanks for the tips! What a great list of September favorites!!! I need to try some of that facial spray!! What! Totally going to have to try the facial spray! Thanks for the tips! 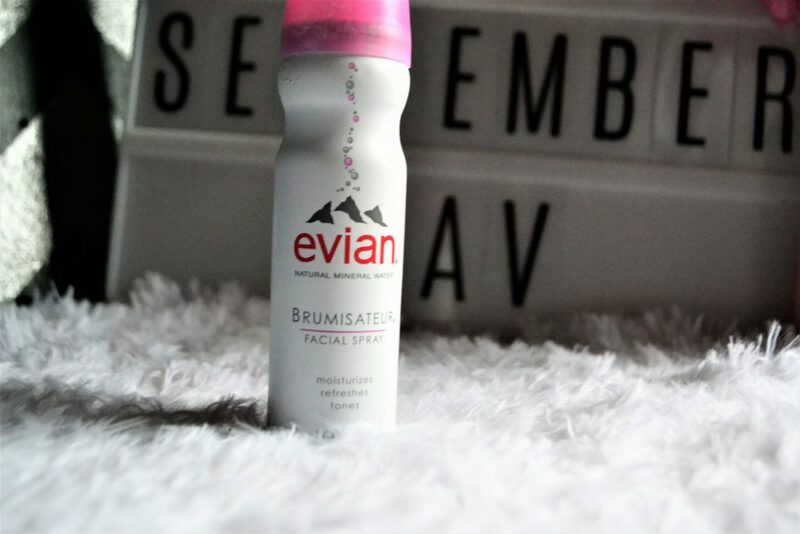 That Evian facial spray looks like it could be pretty handy this season! AND I’ve been looking for a good foundation, so I’m really glad you shared these 🙂 Thanks for sharing your September favorites! Love the Morphe pallete! I need to give that a try; those tones are right up my alley! OOooo now i need to go shopping. I love all of this stuff! Loving the new blog! I’m definitely getting the Morphe palette as those colors are my fave! Tx for sharing! Oh man, I gotta try out the Evian spray! I’m in Colorado and it gets so dry 🙂 Thanks for sharing your Septemeber favorites! 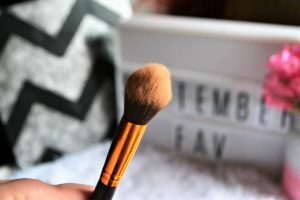 This was a great read, I love the idea of doing monthly favorites like September Favorites, so fun! Oh wow, great tips! Never even heard of a spray like this. Living in Colorado, sure do need it! Thank you! I worked hard on it! Loved seeing your favorites this month! I’ll have to try a few of the or sure! 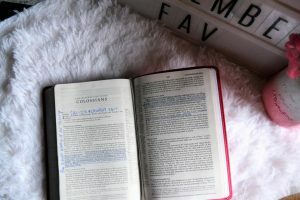 That is one beautiful bible!! Definitely my pick of your September Favorites! Thanks for sharing. 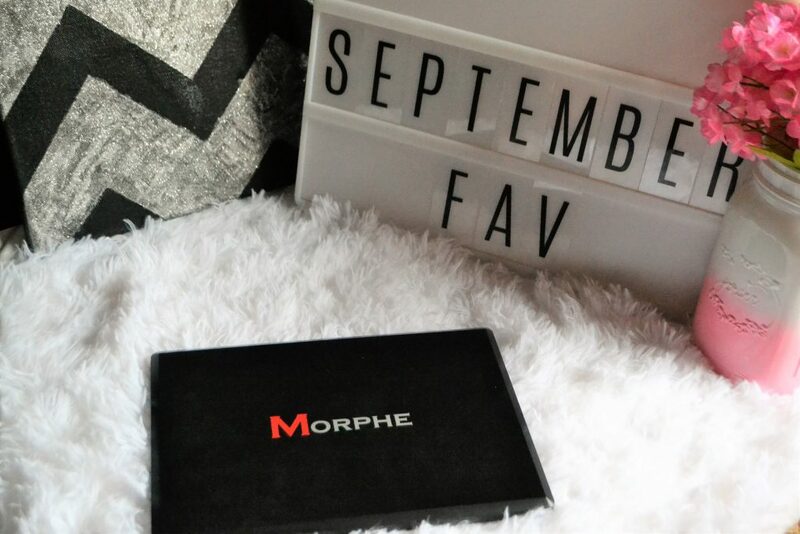 Loving your September favorites! Your new blog style is also super! Thank you for sharing! oh my gosh i have gotten attacked by the mini section at ulta one too many times! i’m loving all of these favorites you touched on! I love Evian spray and Laura Mercier! These are awesome September Favorites!!! so many cool favorites! I love that NYC liner and the palette is so gorgeous!